In 1957, to celebrate the centenary, a comprehensive index was prepared. This consists of a Subject Index, an Index of Authors, and an Index of Ships Mentioned. Please right-click on this link for a PDF version, Index of Transactions 1857-1957, choose "Save Link As" and decide which folder you want to keep it. To obtain a copy of any of the papers published in Transactions, please contact us and we will arrange this for an administration fee of £10 plus postage and packing. 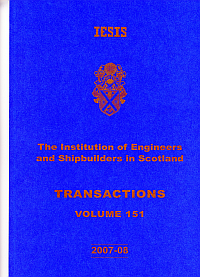 The Transactions include all of IESIS Prestige Lectures delivered as the Macmillan Memorial Lectures and the Marlow (Scotland) Lectures. A Transport Policy for Scotland by the Millennium, IESIS Essay Competition - Dodds, Graeme, K ESIS for young members. An Artist's View of Structural Design - Macleod, Professor Ian A, PhD, CEng, FICE, FIStructE, and McCulloch, M, Dip Art An engineer and an artist discuss the vital interface between their disciplines. Detail Design for Double Hull Oil Tankers: No Room for Complacency - Ferguson, J M, (Lloyd's Register) Marine Engineering with special reference to the work of LLoyds on double-hulled oli tankers. Forensic Engineering and Expert Advice - Reid, Robin C, BSc, CEng Forensic Engineering applied to the detection of maritime crime and fraud. Fracture Avoidance in Welded Steel Structures: Are Recent Test Standards Useful to Industry? - Sumpter, Dr J D, BSc, MSc, PhD, Modern welding techniques and standards. Future of Nuclear Energy in Scotland: Parsons Memorial Lecture - Jeffrey, Dr Robin, FEng, MIChemE Aspects of nuclear power generation. Heavy Lift Operations: Piper PUD Module - Williams, Hugh M, (Heerema Engineering Services, London) The recovery of heavy objects from the sea bed. Launch of the Great Eastern and the Aftermath - Forbes, Donald A, BSc, CEng, in its time the largest ship afloat. Long Term Slipping of the Clipper Ship Carrick, ex City of Adelaide - Walker, Fred M, BSc, CEng, FIES, MacCalman, Crawford, CEng, Sparkes, Roger K, BSc, CEng. The clipper ship Carrick, formerly City of Adelaide, sank at her moorings but was later recovered and is now being restored. Fred Walker, IESIS member was responsible for bringing her ashore by slipway. MV Derbyshire: Search, Assessment and Survey - Faulkner, Professor D, WhSch, PhD, DSc, FEng, FRINA, FIStructE, FSNAME, FRSA, The search for the wreck of the containership Derbyshire, in which Professor Faulkner, IESIS President, played a prominent part. Oil Tankers and the Environment - Spyrou, Dr A G, BSc, LLD, CEng. The operation of large oil tankers and their effects on the environment. Production Facilities Selection for Deep Water Oil and Gas Field Development - Inglis, Robert B, BSc, PhD, CEng, FRINA. Producing oil and gas from deep water sites. Safety of Bulk Carriers - Ferguson, John M, Ship safety discussed from the point of view of Lloyd's Register. Ship Safety and Public Concern: Presidential Address - Faulkner, Professor D, DSc, FEng. More about the Derbyshire. Professor Faulkner was also technical advisor to the Commission investigating the disaster. Sinking of SS Titanic: Investigated by Modern Techniques - Hackett, C, BA(Hons), CEng, MRINA and Bedford, J G, BSc(Hons), CEng, FRINA. Studies of the Titanic using modern methods throw new light on the disaster. Sizewell B and the Future - Smith, Paul, BSc, CEng, MIMechE. Power Generation at Sizewell B Nuclear power station. The Skye Bridge - Carson, John R T, BSc, CEng. Construction of the controversial bridge. Telford Dock, Aberdeen Harbour - Still, R D, BSc, CEng, FICE, Description of the new dock facility by a civil engineer who took part in the operation. Upgrading of the A74 to Motorway - Blackwood, Hugh, BSc, MSc, FICE, FIHT, MConsE. Detailed description of the civil engineering carried out in a major roadbuilding project. Water - The Scottish Dimension - Davidson, Donald (West of Scotland Water). A wide-ranging Paper on future water supply requirements in Scotland. Why I Chose to Study Engineering: IESIS Essay Competition - Jeffers, Matthew J F, a young engineer gives his interesting views on engineering as a career. Why Use Bucket Dredges and What Developments Are Taking the Mining Industry into the 21st Century - MacVicar, A, (Alluvial Dredges Ltd) Dredging in the 21st Century.